Come 2019, the Cardston-Siksika riding, formerly Little Bow, will have a new MLA. The current Little Bow MLA, Dave Schneider, has announced he won’t be seeking re-election in next year’s provincial contest. “Mostly it’s the fact that I’ve served for 10 years, when this term is done, depending when it ends it could be more. Ten years in politics, I’ve served my community as I sat on Vulcan County for six years and now I’ve had the chance to serve the province for a term. My wife and I made a decision on what we were going to be doing this time in our lives a long time ago. I thought this was the appropriate time for someone younger, I’m not a kid anymore. Someone younger to take the torch and move forward, there will be a young conservative from some where in the riding that wants to let their name stand,” said Schneider. Schneider was elected as an MLA for the Little Bow riding as a member of the Wildrose Party in 2015 after narrowly defeating Progressive Conservative candidate Ian Donovan by 0.01 per cent. Schneider originally stated he would be seeking re-election last year, but during the months since he changed his mind, citing the long drives and time away from family as reasons to step away. While he still has a year left before the next election, Schneider says the next MLA for the new Cardston-Siksika riding will need to be committed to canvas its large area. Since coming into the fold as the Little Bow MLA in 2015, Schneider says the people around him have made it an enjoyable term.With it coming to an end next year, he says the people he has worked with and the people he has met as the MLA will be the biggest thing he’s going to miss. Schneider credits former Wildrose Party Leader Brian Jean as a mentor for his early days as a new MLA and he helped him learn the ropes. Throughout his term he has also seen plenty of political changes. None bigger than the merging of the Wildrose Party and the Progressive Conservatives to form the United Conservative Party. “We throttled down two conservative parties and created one. On the fourth to the sixth of May, we will be letting the members tell us what the policies should be, which is exciting. I think we’re the most popular party in Canada, from what I understand 117,000 members or more. It will be exciting to look back and think about being a part of history and a founding member of the UCP. Certainly the people I’ve worked with have been tremendous. When we got to Edmonton back in 2015, there were 22 of us, only three of us had been MLA’s for Alberta, 19 of us were pretty green. Brian was our leader and he was really good about mentoring us, leading us through and showing us how it worked,” said Schneider. The merger brought a new leader in Jason Kenney, who was elected as leader in October 2017 after he defeated Jean and Doug Schweitzer by a large margin. Since working with Kenney, Schneider has been impressed with what Kenney brings to the table politically. Even with the finish line in sight for Schneider, he realizes he still has plenty of work to do before his four year term completes. One of the biggest things he is focusing his efforts on is continuing to be sturdy opposition to the NDP Alberta government. “We have the AGM (annual general meeting) coming up in May and we have to get a Cardston-Siksika riding association set up. We’ll just continue doing what we’re doing up there, being an effective opposition to the government and that’s what people are looking for and appreciate the hard work to hold them into account,” he said. 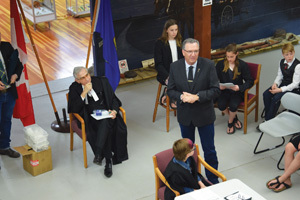 When his time is up as the Little Bow MLA though Schneider will look back fondly of the four years he served.